Preston searches to find out what happened to his sister Sarah at the creek that night. One thing leads to another and he finds something he has a hard time coming to terms with. If he hadn’t seen it with his own two eyes he would have never believed it either. Once he watches the video he finds evidence of some strange things living and dwelling around Sandy Creek. He has no choice but to believe it. Preston, his girlfriend Shayne, his best friend Aaron and Kimberly take a path that cannot be reversed. He wants to avenge his sister’s death and gets more information than he ever thought possible. Perception is 9/10ths of reality. It is more than anyone could have ever expected. It is based on several stories I have personally been told. Once again things happened at this location that no one can fully understand or explain. 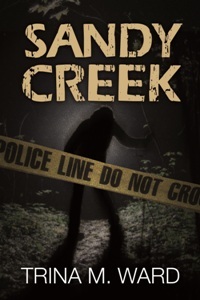 I lived near Sandy Creek for the majority of my childhood and I can assure you it is eerie at dark and I am not the only one who claims to have been told of the creatures’ existence.